From 15th to 24th of July in the picturesque renaissance town Tryavna will be organized a youth project „The art never dies – it transforms!“ (ref. № 2017-1-BG01-KA105-036088). By realizing it we want to connect the beautiful with the useful, pleasant, environmental friendly and all this subsequently to be converted to a way of developing entrepreneurial business. Our desire is to present old-fashioned techniques of working in a new light and how they can be combined with seemingly unnecessary materials, junk, in the making of products of art or useful and usable household items. Entry into the profession, the purpose of using old-fashioned and basic equipment Iconography, carving, sculpture and painting and applying them in our daily lives. Stimulating the creativity of young people in the field of arts. How to use seemingly unusable materials from our daily lives and making them relevant art and usable household items. Young people to learn the basic techniques and principles of development of entrepreneurial idea and its development in the socio-entrepreneurial business. Based on their desire for a future career in this field and their love of art, we linking the two of the most common problems in the labor market for young people – lack of funds to start the realization of an entrepreneurial idea and lack of knowledge in this field. Combining all this and mix it into a single pail of paint, we hope the color we will get, to consist the exact features needed, to paint the future pictures of their own lives. The Youth Exchange will be attended by 19 young people from 3 countries (5 persons from each of the country: Bulgaria, Greece and Italy) and 3 youth leaders (one from each participating country). The group of each country will be obligated to conduct dissemination events for other young people in their city/town, within 2 months at the end of the youth exchange. All the training will be done through the methods of non-formal education. 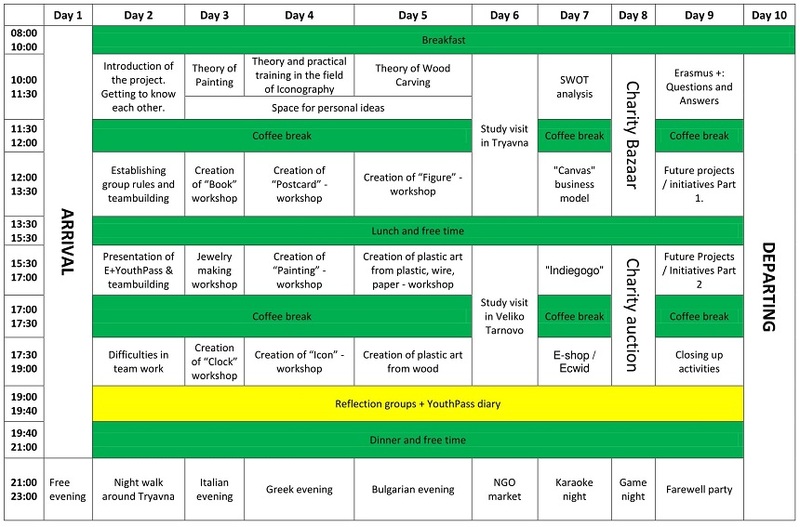 The activities will be for example brainstorming, plenary discussions, simulations, role plays, team building, energizers, ice breakers and many others. We remind you that non-formal education is voluntary, non-hierarchical and all the methods are based on the concept of learning by doing. – Bring a towel for the shower, because it is a school dormitory and students have their own, which are not provided by the facility. – Bring your hygiene products (shampoo, toothpaste, etc…). – Bring comfortable clothes and shoes (we will walk). – Each group should bring some food and drinks to represent their own country. – Bring your national flag, magazines, postcards what will help you to introduce your country. – Bring your sending organization’s leaflets and any kind of information what you might have. – Please, find a nice mug from your city/town/country and bring it to the training course. On the first day we will make a lottery and you will get a cup that you can use the whole week and later bring home with you as a memory. Less plastic, more beauty! – If you bring your laptop will be easier for working. 100% of the participants‘ travel costs will be reimbursed within the valid budget sums calculated according to the official rules of the Bulgarian NA in the frame of Erasmus +. If a sum exceeds the limit, the excess will be paid by the participants themselves. The reimbursement limit is 275€ per participant from Bulgaria. 2) You need to use PUBLIC TRANSPORT e.g. planes, trains, buses, trams or underground. 3) You need to depart from the country where your sending organization is. 4) It is recommended to make scans of tickets before your arrival in case you lose them. The reimbursement will be done only in Euros. From Sofia: We will arrange a bus to come, pick you up and bring you back from the airport/bus station. Eligible participants per country: 5 young motivated people from Italy and Greece at the age of 16-24 and 1 group leader with no age limit. Accommodation: in double/triple rooms in the dormitory of the National High School of Fine Arts in Tryavna, ul. “Angel Kanchev” 150. Daily meals: Each day we`ll eat in different traditional restaurants. Menu will be adapted to the dietary requirements of each participant. Lunch at 13:00-15:00 and dinner at 19:00-21:00. Insurance & Health assistance: The insurance is a responsibility of each participant. The cost for issuing it will not be covered by the hosting organizations. Before you come to Bulgaria, we highly rec­ommend that you ask for a European Health Insurance Card. We won`t replay to empty e-mails! Posted on 24/04/2017 at 16:45.